Researchers from MIT have designed a quantum-dot spectrometer that is small enough to function within a smartphone, enabling portable light analysis. Instruments that measure the properties of light, known as spectrometers, are widely used in physical, chemical, and biological research. These devices are usually too large to be portable, but MIT scientists have now shown they can create spectrometers small enough to fit inside a smartphone camera, using tiny semiconductor nanoparticles called quantum dots. Such devices could be used to diagnose diseases, especially skin conditions, or to detect environmental pollutants and food conditions, says Jie Bao, a former MIT postdoc and the lead author of a paper describing the quantum dot spectrometers in the July 2 issue of Nature. This work also represents a new application for quantum dots, which have been used primarily for labeling cells and biological molecules, as well as in computer and television screens. “Using quantum dots for spectrometers is such a straightforward application compared to everything else that we’ve tried to do, and I think that’s very appealing,” says Moungi Bawendi, the Lester Wolfe Professor of Chemistry at MIT and the paper’s senior author. The earliest spectrometers consisted of prisms that separate light into its constituent wavelengths, while current models use optical equipment such as diffraction gratings to achieve the same effect. Spectrometers are used in a wide variety of applications, such as studying atomic processes and energy levels in physics, or analyzing tissue samples for biomedical research and diagnostics. Replacing that bulky optical equipment with quantum dots allowed the MIT team to shrink spectrometers to about the size of a U.S. quarter, and to take advantage of some of the inherent useful properties of quantum dots. Quantum dots, a type of nanocrystals discovered in the early 1980s, are made by combining metals such as lead or cadmium with other elements including sulfur, selenium, or arsenic. By controlling the ratio of these starting materials, the temperature, and the reaction time, scientists can generate a nearly unlimited number of dots with differences in an electronic property known as bandgap, which determines the wavelengths of light that each dot will absorb. Scientists are also working on solar cells based on quantum dots, which rely on the dots’ ability to convert light into electrons. However, this phenomenon is not well understood, and is difficult to manipulate. On the other hand, quantum dots’ absorption properties are well known and very stable. “If we can rely on these properties, it is possible to create applications that will have a greater impact in the relative short term,” Bao says. The new quantum dot spectrometer deploys hundreds of quantum dot materials that each filter a specific set of wavelengths of light. The quantum dot filters are printed into a thin film and placed on top of a photodetector such as the charge-coupled devices (CCDs) found in cellphone cameras. The researchers created an algorithm that analyzes the percentage of photons absorbed by each filter, then recombines the information from each one to calculate the intensity and wavelength of the original rays of light. The more quantum dot materials there are, the more wavelengths can be covered and the higher resolution can be obtained. In this case, the researchers used about 200 types of quantum dots spread over a range of about 300 nanometers. With more dots, such spectrometers could be designed to cover an even wider range of light frequencies. “Bawendi and Bao showed a beautiful way to exploit the controlled optical absorption of semiconductor quantum dots for miniature spectrometers. They demonstrate a spectrometer that is not only small, but also with high throughput and high spectral resolution, which has never been achieved before,” says Feng Wang, an associate professor of physics at the University of California at Berkeley who was not involved in the research. If incorporated into small handheld devices, this type of spectrometer could be used to diagnose skin conditions or analyze urine samples, Bao says. They could also be used to track vital signs such as pulse and oxygen level, or to measure exposure to different frequencies of ultraviolet light, which vary greatly in their ability to damage skin. “The central component of such spectrometers — the quantum dot filter array — is fabricated with solution-based processing and printing, thus enabling significant potential cost reduction,” Bao adds. The research was funded by MIT’s Institute for Soldier Nanotechnologies. 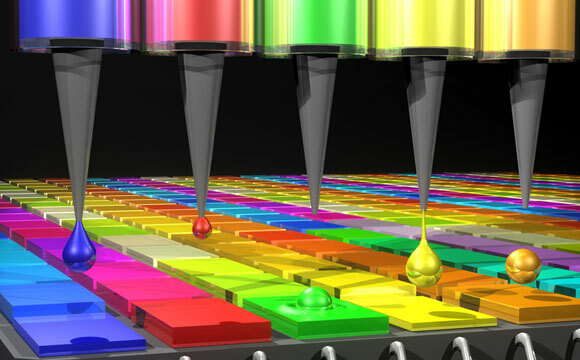 Be the first to comment on "MIT Chemists Develop a Quantum-Dot Spectrometer"